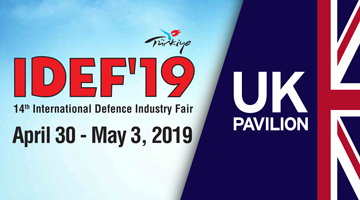 IDEF 2019 will be the 14th edition of the International Defence Industry Fair and hosted by the Ministry of National Defense and under the management and responsibility of the Turkish Armed Forces Foundation. It provides the opportunity to follow up on technological developments in industry as well as build international collaboration in supply programs. IDEF is the largest event of its kind in the Eurasian region. We will be organising the UK Pavilion and have secured over 200 square metres of space in a prime location in Hall 2, offering shell scheme packages, pod packages or space only areas for companies wishing to build their own stand. The FCO website provides up to date guidance on travel to Turkey. For the most recent information please visit their website here. Please download the floorplan and review what is included in the exhibiting options. Prices are quoted per square metre. The UK pavilion is now fully booked. We are able to offer additional facilities for visiting UK companies. Please contact us for further information.